It is well-known in the Speech-Language Pathology community that children with speech and language delays are at risk for challenges in their literacy development. Because of this, SLPs often include literacy activities, or with very young children, emergent literacy activities, in their therapy sessions. Emergent literacy skills are those that develop before the more formal reading and writing tasks that typically come to mind when we think of literacy. Exposure to environmental print such as the logo on a storefront or a neighbourhood stop-sign, and learning the routines associated with books (e.g., how we hold then, turning pages one-by-one and talking about the book as we do so), are both part of emergent literacy development. Becoming aware of and interested in print and its many purposes at an early age is important for all children, but even more so for children who have speech and language disorders and delays. Early childhood literacy specialists encourage parents and caregivers to read books with their babies, toddlers and preschoolers every day. In fact, many suggest that we read to our children for at least fifteen minutes every day. When an SLP assesses a child’s speech and language, he/she is able to identify which skills are not developing as expected, as well as which ones that child may be ready to work toward improving. These suggestions can be carried over in to daily activities, such as book-reading, to help a child move forward in his/her speech development. When a child is demonstrating speech errors beyond what is considered developmentally appropriate, exposure to print and books is very important. These children are at risk for challenges in reading development, and academic development as a result. In addition to the enjoyment of exploring stories, and spending quality time with a parent/caregiver, and building those literacy skills, ‘book-time’ offers the opportunity for some low-key speech sound bombardment and informal speech practice. When an SLP has identified a speech sound, or group of sounds, that a child needs help to develop, one step in repairing this error is for the child to become more aware of that speech sound – what it sounds like, looks like and when/where it is used. This will be the ‘target sound’ in this strategy. Auditory bombardment helps to improve the awareness of particular speech sounds. We can help a speech sound stand out and become more obvious to the child by making it a little louder than usual, longer than usual if possible, or by pausing just before we say it, while maintaining the natural rhythm and intonation pattern of the words. 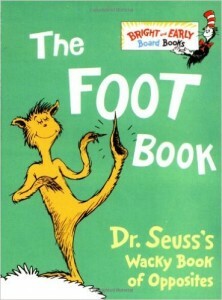 An example from a popular children’s book by Dr. Seuss (‘The Foot Book’) is, ‘Left (pause) ffffoot, left (pause) ffffoot, left (pause) ffffoot, right. Ffffeet in the morning and (pause) ffffeet at night’. When you choose a story with a character’s name or series of key words that contain the target sound, you create an opportunity for your child to practice listening to the target and become more aware of it. Many children’s books have a word or phrase that is repeated many times throughout the story. After you say the word/phrase that you are targeting, you can pause to wait expectantly for the child to repeat it – without creating pressure/expectation. 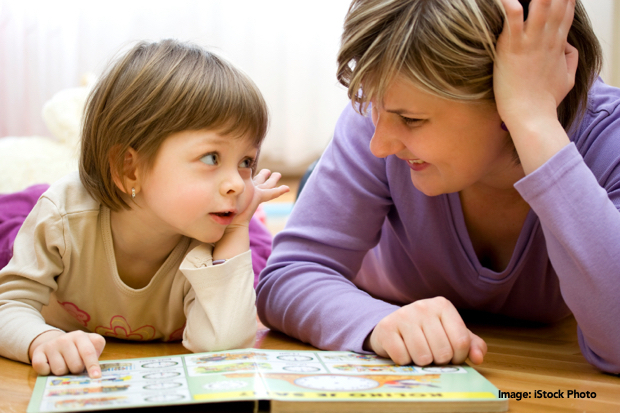 Once a child is familiar with a book, the adult reading the book with him/her can start to pause before saying the repeated word/phrase and wait for the child to fill in the blank. When you are working with an SLP, he/she will provide you with the speech sounds that are appropriate for your child to target. With this information in mind, you can seek out a book that matches your child’s speech goals. Some examples are ‘Where is green sheep?’ by Mem Fox (for ‘sheep’), ‘I was so mad’ by Mercer Mayer (for ‘mad’, ‘so’, ‘was’), or ‘The Very Busy Spider’ by Eric Carle (for ‘spider’ and ‘web’, or ‘spinning her spider web’). A quick internet search can lead you to many suggestions for children’s books that can be helpful to you. When we read books with children we nurture their imaginations, build literacy skills, share information about the world and spend quality time together. If we plan ahead a little bit, and choose books with care, this wonderful opportunity can also support a child’s speech therapy programming in a relaxed and fun way. We appreciate your interest in this blog post. The text contained in it is copyrighted by SoundIntuition as of the date of publishing. Contact us by leaving a comment on this post if you would like to use this text elsewhere. When used, we would ask that you cite this page, using the full URL (http://soundintuition.com/blog/literacy-speech-development), as being the originator of the content.